I couldn't find somethign precise on the internet, so tell me your ideas to fix this. 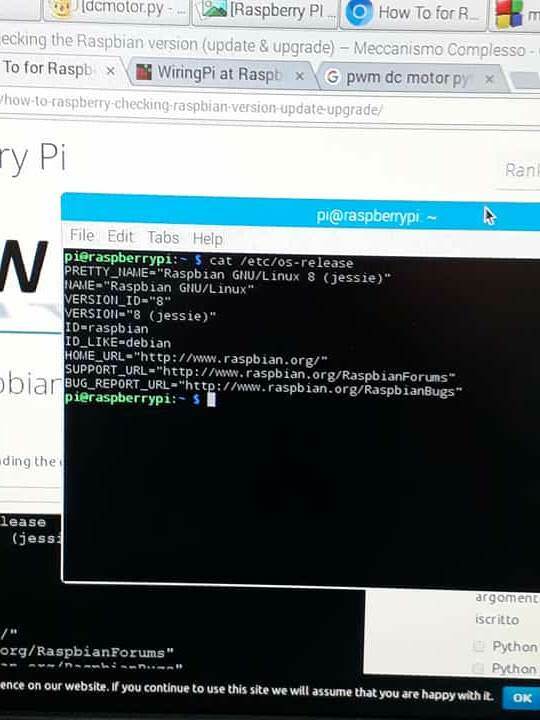 Are you on Raspbian ? Which version ? Any cross-compiling involved here ? Only tip I can give is to make sure the package "gettext" is installed and then maybe recompile (all) before trying to run it again. The package "gettext" is installed, I've tried that. The version of the Raspbian is the newest. I come back to the question "Is this crosscompiled or is the code originally meant for windows ?" 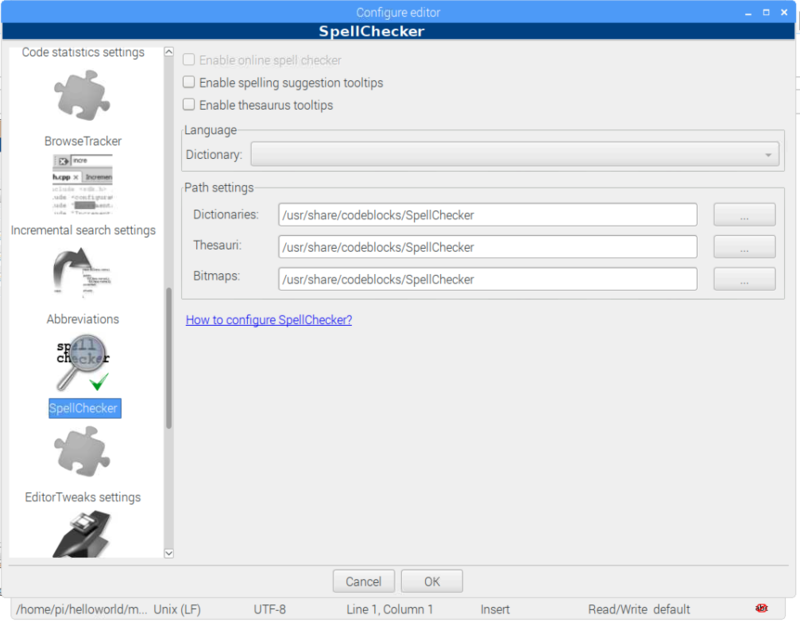 What are the compiler/project options in codeblocks. Can we see the GCC compiler logs. In these cases I go to packages.debian.org and search for which package might include the missing file. We have after all mostly the same packages in Raspbian Stretch and Debian Stretch. And according to that site there is no library file in stretch with the name "libgnuintl" so I'm asking myself, how did you successfully link you program if the library cant be installed. There is also the possibility that your codeblocks project actually creates this library, and therefore manages to link with it, but does not have the correct path configured when running programs depending on it. I don't understand this question at all. But, I've wrote this code in Visual Studio on Windows and there it works alright. 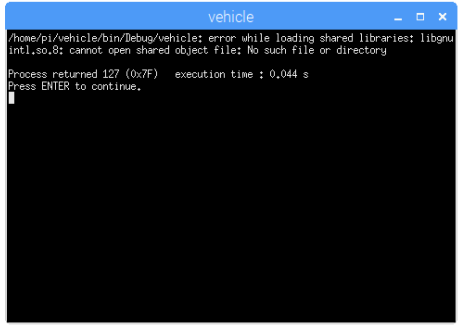 Now, I want to make the same thing on the Raspberry Pi, but I get this error. Did you compile/link the program on Windows and deploy on your Raspberry? Or did you move the source code to your Raspberry and compile on there? Can you post an example program that doesn't work on here (in [code]... your stuff goes here ...[/code] tags)? I expected this based on what I saw on google when I searched "libgnuintl". I think Windows have their own library for translations called "libintl" so when you want to make portable software between Linux and Windows and need to use Linux gettext/libintl you rename it to "libgnuintl" on Windows to avoid linking with the wrong library. So my best guess is that there still is something in the project or settings of CodeBlocks that still refer to this libgnuintl. But there is a lot of details here we dont know. - Did you choose to include translation options in your application or is it something OpenCV comes with ? - In that case how did you install OpenCV ? - Did you create your application from scratch with OpenCV or did you follow some examples or example project-files for VS ? DougieLawson wrote: Did you compile/link the program on Windows and deploy on your Raspberry? Or did you move the source code to your Raspberry and compile on there? I just copy the source code and paste it in Code Blocks on Raspberry PI. I can't post the code because its over 1000 lines. - I didn't include anything connected with translation. And I've changed a little bit for my purpose. And now let me tell you a fun fact. I'm going in an Academy about programming, robotics and mathematics. They own Raspberry Pi, I've tried the same code there and went OK. It worked with no problem. If you can't answer a simple question with a simple answer and a simple source code example, then I'm out of here. I just copy the source code and paste it in Code Blocks on RPi. The build was successful, but when i run it I get that error. I don't know what's not answered. They own Raspberry Pi, I've tried the same code there and went OK. It worked with no problem. Using codeblocks there too ? 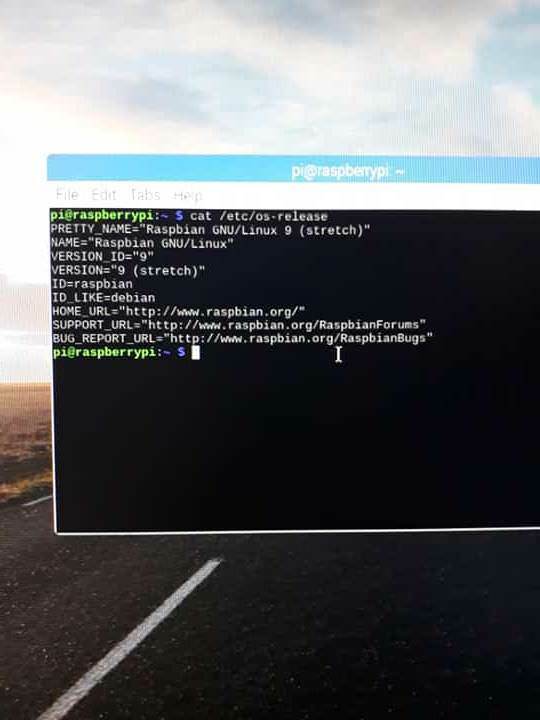 Running same version of Raspbian ? There is this "ldd" command that you can run on a compiled program, it will tell you all the dynamic libraries it depends on and where they are found (if found). 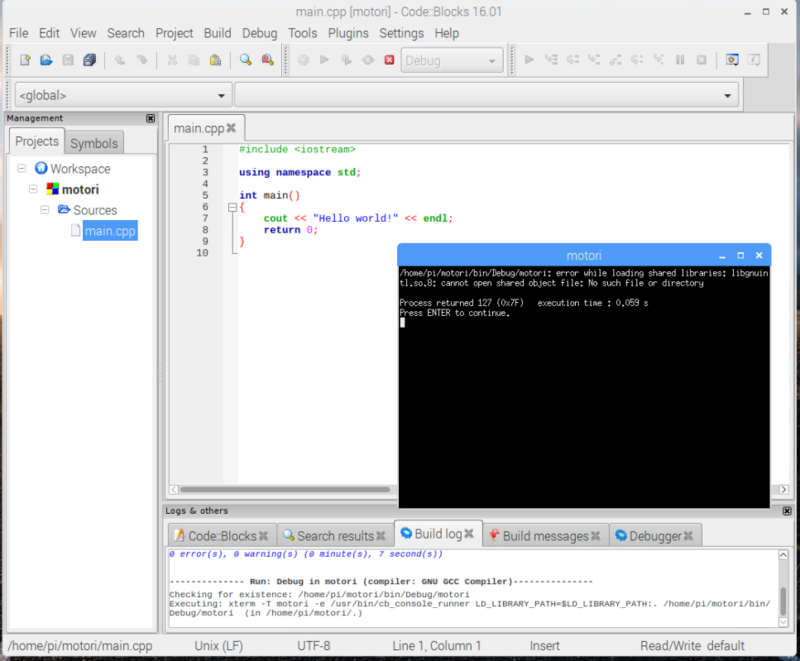 - The working code does not depend on "libgnuintl", meaning that there are differences in compiler environment. Then you can verify that the installed compiler works..
No problem building the commad-line test C++ code here in Code::Blocks under Raspbian Stretch. What is the output of your build log window? This gave me version 16.01. The only configuration I did was to set GCC as the default compiler, as it complained it had something mis-configured until I did. 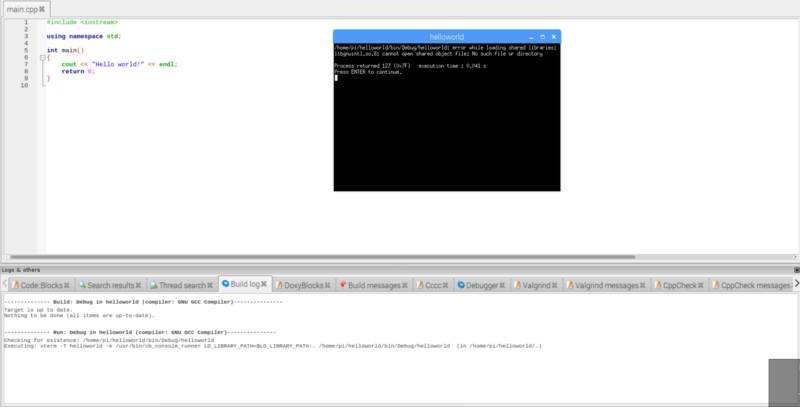 scruss wrote: No problem building the commad-line test C++ code here in Code::Blocks under Raspbian Stretch. but several people have asked for this.. please give us this if you want relevant help.. Please stop bumping the thread. People (not just me) have tried to repeat your process. It works for them, it doesn't work for you. There must be something else wrong with your setup. 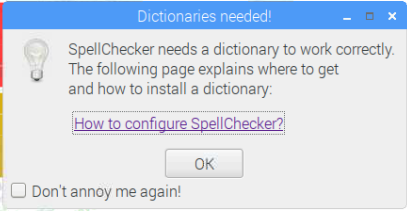 We can't repeat your errors, so please stop expecting us to magic up answers.